Poeas was a hero found in the stories of Greek mythology. Poeas would be named in many ancient sources as one of the Argonauts, but his fame would be overshadowed by that of his son Philoctetes. Poeas was normally described as being the son of Thaumacus by a woman unknown; Thaumacus being the eponym of Thaumacia in Magnesia. Commonly, Poeas was called King of Meliboea, but perhaps he also ruled over Olizon, Methone, and Thaumacia (the town of his father), for these were regions from which his son would gather his troops in preparation for the Trojan War. The son of Poeas was the legendary bowman, Philoctetes, born to either Demonassa, or Methone. Poeas was named by some amongst the Argonauts, the band of heroes who travelled to Colchis for the Golden Fleece. Poeas was named as the greatest archer amongst the company, at least after the departure of Heracles, and the archery skill of Poeas was said by some to have been put to use on Crete. At Crete, the Argo was stopped from landing by the bronze giant Talos. Talos was considered invulnerable but there was a vein of life blood that ran from head to ankle, but Poeas killed Talos by shooting an arrow into his heel. Poeas also appears in the story of Heracles’ death. Having been poisoned by his own infused cloak, Heracles constructed himself a large funeral pure upon Mount Oeta. Heracles then laid down on top of the pyre, and asked all those who passed by to light it. 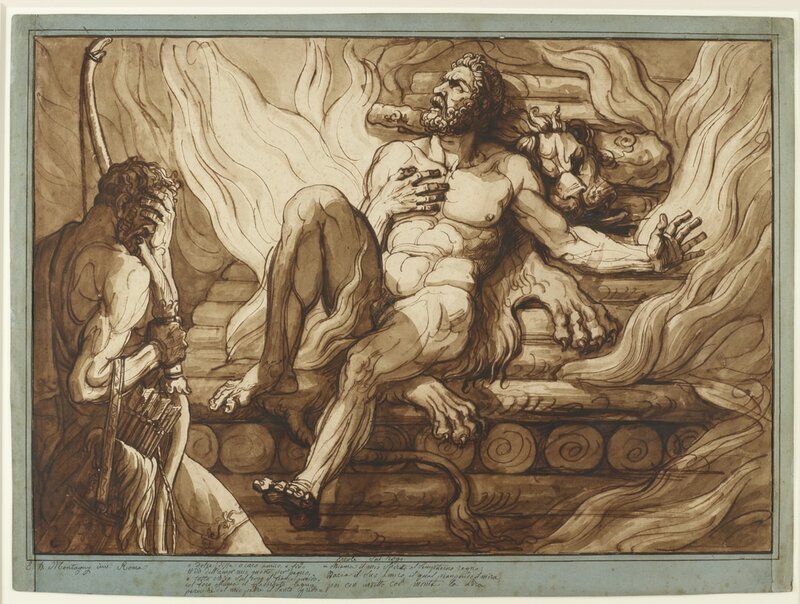 None was willing to do the deed though, until Poeas came to the pyre; Heracles’ pyre having been constructed in what might have been part of his kingdom. Heracles was both an old comrade and friend of Poeas, and so King Poeas agreed to the wish of Heracles. Heracles would then present Poeas with his bow and arrows, before the pure took light, and the apotheosis of Heracles occurred. Later on, Poeas would present the bow and arrows of Heracles to his son, Philoctetes. Some however miss out the role of Poeas in the tale, stating instead that Philoctetes was the passer-by.